New ice is easily broken up by strong waves and wind. Photo by Laura Pratt. 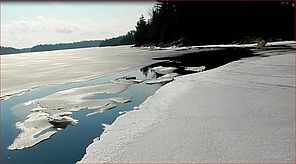 Much of the information in this article is drawn from Bob Dill and his team of contributors, who have worked tirelessly to develop an in-depth website on lake ice behavior. A winter recreation enthusiast and Champlain Valley resident himself, Bob Dill founded the website Lake Ice in an effort to study lake ice from a recreational perspective. The site is full of information on different kinds of ice, the stages of a thaw, ice safety, and cautionary tales of accidents on the ice. It’s a highly recommended read for anyone who plans to venture out onto a frozen lake. Nestled between the Adirondacks and the Green Mountains, Lake Champlain is no stranger to cold, snowy winters. Wild ice – ice which forms naturally on lakes and ponds – is a special attribute of northern climes. Ice skating, skiing, show-shoeing, kiting, and fishing all rely on a thick layer of ice forming during the winter months. However, thaws can happen at any time during the ice season, and with climate change winter temperatures are becoming more unpredictable. While a century ago ice usually closed on Lake Champlain, today it’s become a rare and celebrated event when the lake freezes over at all. Many elements drive ice melt on the lake, the most obvious of which is sunlight. Sunlight is the primary driver behind internal melting – melting that occurs within the ice sheet, at the triple junctions, grain boundaries, crystal structure imperfections, and within individual ice crystals. Internal melting can dramatically weaken the ice sheet without significantly thinning it. Tiny pores will open up in the ice as the meltwater drains through it, making it more fragile. Direct sunlight can also melt ice along the shorelines facing the sun, so it becomes difficult to return to land. In shallow areas the sun shining through the ice can actually heat the water, which then melts the ice from beneath. Candled ice appears during the late stages of a thaw, and will break apart in chunks. Photo courtesy of Bob Dill. Warm temperatures can do as much to internally melt ice as the sunlight, if only over a longer period of time. Thick ice weakens slowly, but it also recovers slowly. While two inches of ice might last only two hours in moderate thaw conditions, a foot or more of ice can last several days. However, safety guidelines for ice thickness should be doubled or tripled after a thaw, until the ice has several days of below-freezing temperatures to recover. While rain is as bad for snow as it is for cotton candy, it has relatively little effect on ice melt. For example, around one inch of rain at 40°F temperatures will only cause about 1/16 inch of ice loss. One exception to this is the formation of drain holes – if the ice has experienced little internal melting, and the puddle is too large to be blown apart by the wind, it may be funneled through any crack or hole available. As the water drains away these holes are noticeably eroded, becoming large enough to catch an unwary foot, skate, or iceboat runner. The wind that accompanies the rain often does more damage than the rain itself. Warm wind is the primary driver behind top surface melting. For example, over a 24-hour period at 50°F, strong (20-30 mile per hour) winds can cause over two inches of ice loss. In the same period, heavy rain and only moderate wind result in just one inch of ice loss. Wind can also be responsible for tearing holes in the ice – thin new ice and well-thawed thick ice are particularly vulnerable to a phenomenon called “rafting”, where ice sheets are pushed over themselves at pressure ridges and along shorelines. Wind blowing over puddle drain holes can tear them further open, causing them to be up to 20 feet in size. Both of these phenomena create open water that is then stirred by the wind, bringing warmer, deeper water to the surface to melt the ice. Just as wind wears away at the ice from above, currents erode it from below. 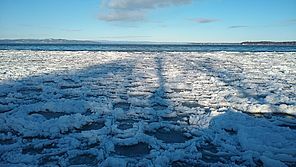 Under-ice melting is common in rivers, lake sections with river characteristics (such as Crown Point, Five Mile Point, and Chipman Point on Lake Champlain), under bridges, and anywhere that water has a strong flow – particularly through narrow spaces. For this reason river ice is considered especially unsafe, and you should always exercise caution before putting weight on it. Ice in the final stages of melting – ridges usually melt faster, as is shown by the line of open water. Photo courtesy of Bob Dill. As the elements of sunlight, warm air, rain, wind, and currents work away at the ice, it can go through several stages of thaw. In the early stages thawed ice can still be safe. Minor internal melting, which has quickly re-frozen, will leave only microscopic melt figures in the cold, hard ice. Ice with puddles on its surface, or ice that has recently drained these puddles, can also retain its structural integrity – although you should be careful with heavy vehicles. Ice in the middle stages of a thaw is more dangerous and unpredictable. Continued surface and internal melting will make the ice more fragile, and vehicles are more likely to fall through. 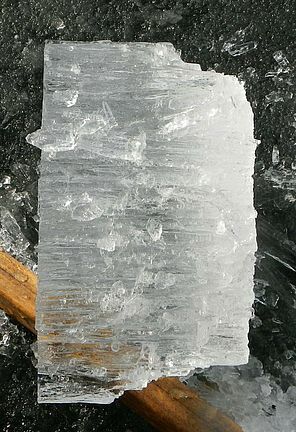 Large grain ice (with a crystal size of several inches to several feet) will become cloudy and grey, while small grain ice (up to one inch in crystal size) is black and uniform. The true danger of ice in the middle stages of melting is that, in continued thaw conditions, it can quickly reach the end stages. End-stage ice is rotten, and even thick ice will hardly hold an adult’s weight. Rotten small-grain ice, often called “candled ice”, is especially dangerous, as the melted crystal boundaries are closer together. Most ice break-throughs occur when people go out on partially-thawed ice that can still hold their weight, and stay as it melts under them. While thaws can make conditions dangerous, there are still ways to stay safe on the ice. Testing the ice by hitting it with a test pole (away from your feet!) can identify any weak spots that won’t hold your weight. Bringing a throw rope, ice claws (also called hand-picks), and a companion are all good ways to stay safe if you should fall through. For more safety tips, and an in-depth look at lake ice, visit the Lake Ice website.